Google is an American company which specializes in Internet-related services and products. It includes online advertising technologies, cloud computing, search, software, and hardware. The company controls the Android operating system which is world’s most popular Smartphone OS. Google has the impressive portfolio of services includes YouTube, Gmail, and Google Search, make it one of the biggest internet companies in the world. Google Pixel 2 XL is an Android Smartphone which is designed, marketed and developed by Google. They were announced during a Google event on 4 October 2017, as the successor to the Pixel and Pixel XL. Google Pixel 2 XL Smartphone was launched in October 2017. The Google Pixel 2 XL comes with a 6.00-inch Touchscreen display with a resolution of 1440 pixels by 2880 pixels at PPI of 538 pixels per inch. The Google Pixel 2 Xl runs 8.0.0 Android version and it is powered by 3520mAh non-removable battery. It will measure 157.90*76.70*7.90 and the weight is 175.00 grams. Google Pixel 2 XL price in India starts from Rs. 73,000. The Google Pixel 2 XL has powered with the 1.9GH octa-core Qualcomm Snapdragon 835 processor and it comes with a 4GB RAM. The Google Pixel 2 XL packs the 64GB internal storage which cannot be expanded. The Google Pixel 2 XL packs the 12.2-megapixel primary camera and 8-megapixel selfie camera. The Google Pixel 2 XL is single SIM Smartphone which accepts Nano-SIM in both the slots. Connectivity options include GPS, Wi-Fi, NFC, Bluetooth, 3G, and 4G. 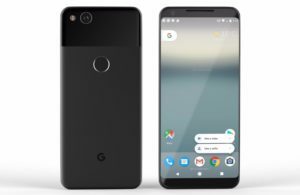 The sensor on Google Pixel 2 XL includes a Proximity sensor, Ambient light sensor, Compass Magnetometer, Accelerometer, Barometer, and Gyroscope. The phone is appreciated for their camera quality and waterproofing, but it was criticized for the removal of the headphone jack, particularly after Google tease Apple for doing the same with its iPhone 7 phone. Google was also criticized for the price of USB-C to 3.5mm headphone adaptor it sells since they have been charged $20 US Dollar while Apple charged $9 US Dollar for the lightning to 3.5mm adaptor and also not including headphones with the phone. News outlet noted that because USB-C is the standard interface, unlike lightning, there is a variety of third-party adapters which retail for less than Google’s official one. In the US version and Project Fi are the exclusive carriers for Pixel 2 XL and Pixel 2. They are also available direct to a customer for use on any wireless network through Google’s online store or from Target and Best Buy.